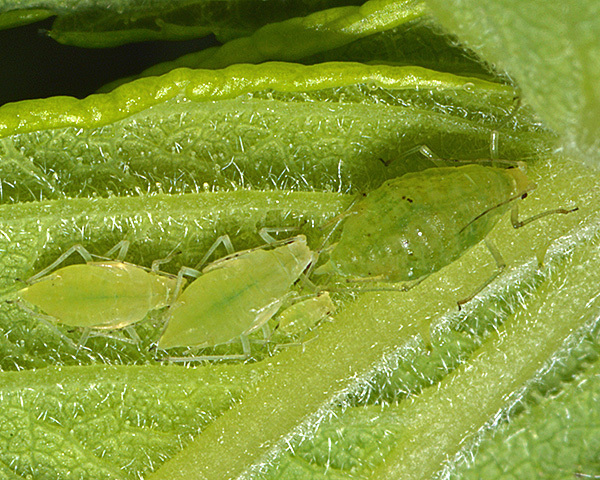 The adult apterae of Metopolophium dirhodum are medium-sized spindle-shaped aphids which range from green to yellowish green, with a brighter green longitudinal mid-dorsal stripe (see pictures below) (cf. Metopolophium albidum which has no green spinal stripe). The antennae are about 0.75 times the body length, and are mainly pale apart from the apices of segments III-V, and parts of segment 6 which are dusky or black (cf. Metopolophium albidum which has antennae that become progressively darker from the base to the apex). The apical rostral segment (RIV+V) is 0.61-0.72 times the length of the second hind tarsal segment (HTII) (cf. 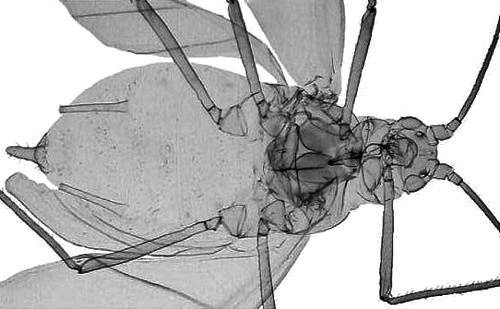 Metopolophium tenerum which has RIV+V 0.92-1.10 times longer than HTII and cf. Metopolophium fasciatum on Arrhenatherum which has RIV+V 0.65-0.78 times longer than HTII ). The siphunculi are long and pale, with slightly dusky tips and are 1.3-1.9 times longer than the cauda (cf. Metopolophium fasciatum on Arrhenatherum which has siphunculi 1.7-2.0 times longer than the cauda). The cauda is pale. The body length of Metopolophium dirhodum apterae is 1.6-2.9 mm. The Metopolophium dirhodum alate (see second picture above) has a pale yellow-green abdomen with darker green markings and sometimes some indistinct brownish cross-bars on anterior tergites. (see picture below). The micrographs below show an apterous adult vivipara, and an alate vivipara (ventral) of Metopolophium dirhodum. 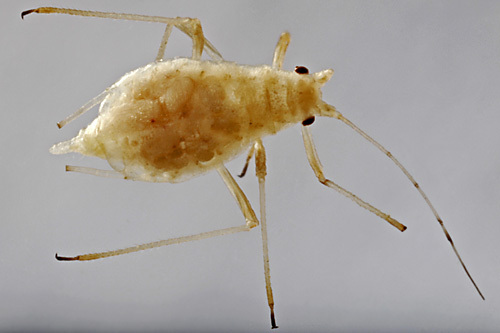 The clarified slide mounts below are of adult viviparous female Metopolophium dirhodum : wingless, and winged. 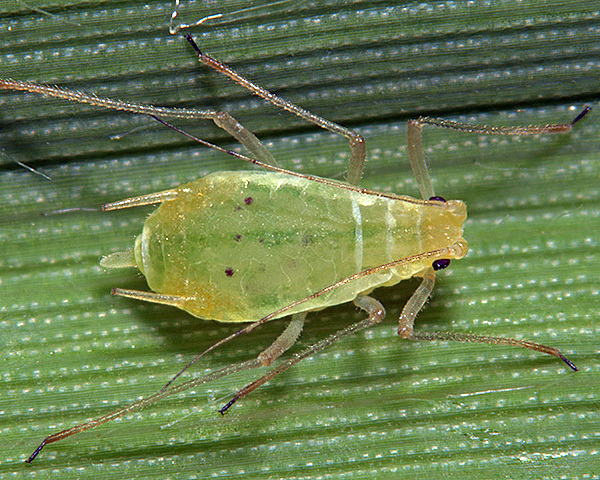 The rose - grain aphid host alternates from rose (Rosa species) as the primary host in spring and early summer to cereals and grasses, especially wheat, barley and maize, as the secondary host. In mild winters they may overwinter on grasses parthenogenetically. Large numbers on cereals can cause economic damage. 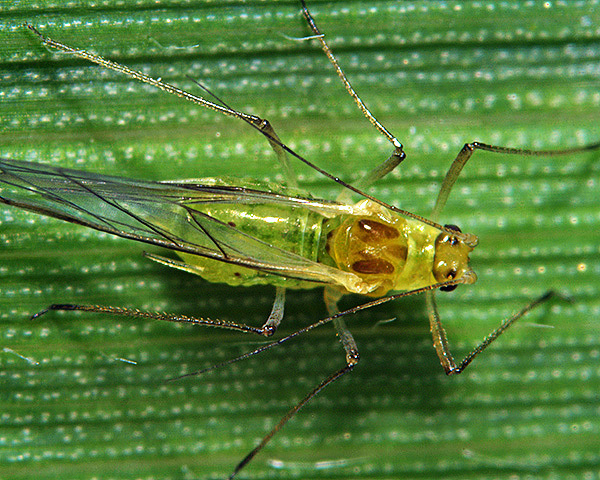 Metopolophium dirhodum also transmit maize mosaic virus and barley yellow dwarf virus. Overwintering eggs laid on rose hatch in March to give fundatrices in April (see picture below of large fundatrix with offspring). Alatae develop in the second and third generations which then migrate to the secondary hosts, grasses and cereals. Populations then increase greatly on the secondary hosts probably reaching a peak in June-July. The return migration of gynoparae to rose occurs in October-November, and their offspring develop to oviparae (see pictures below). 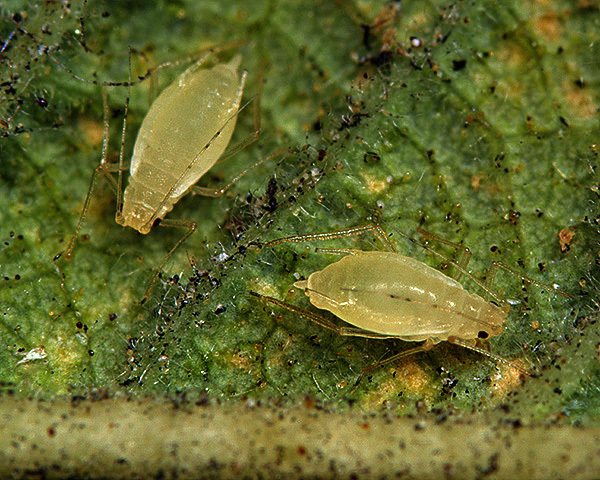 The oviparae of Metopolophium dirhodum on rose (see pictures below) are whitish, pale yellow or pink. Those shown above were found on the undersides of rose leaves in late October and November. 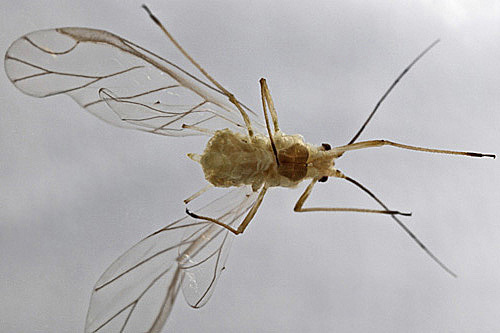 After mating, the oviparae lay overwintering eggs on the rose stems. Metopolophium dirhodum has been recorded on 45 species within the Rosa genus (which contains perhaps a hundred species, plus hybrids thereof). 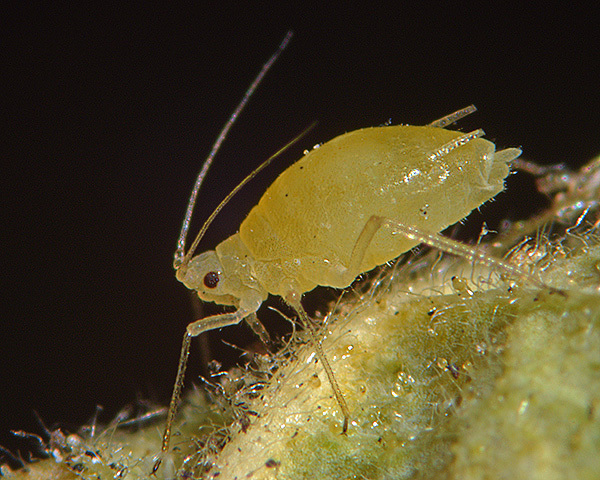 Blackman & Eastop list 71 species of aphid as feeding on plants in the Rosa genus worldwide, and provide formal identification keys. 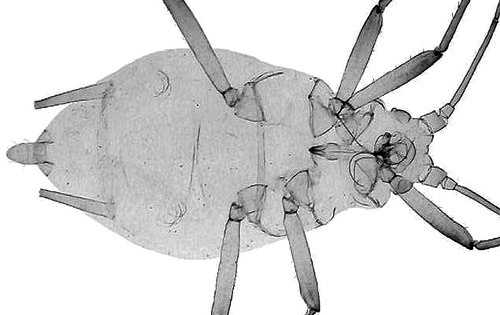 Of those aphid species, Baker (2015) lists 24 as occurring in Britain: Acyrthosiphon malvae spp. group, Aphis (Toxoptera) aurantii, Aphis craccivora, Aphis fabae, Aphis gossypii, Aphis spiraecola, Aulacorthum solani, Chaetosiphon tetrarhodum, Ericaphis wakibae, Longicaudus trirhodus, Macrosiphum centranthi, Macrosiphum euphorbiae, Macrosiphum rosae, Maculolachnus submacula, Metopolophium dirhodum, Myzaphis bucktoni, Myzus ornatus, Myzus persicae Myzaphis rosarum, Neomyzus circumflexus, Rhodobium porosum, Sitobion fragariae, Wahlgreniella nervata and Wahlgreniella ossiannilssoni. Blackman & Eastop (1984) list thirty-or-so species of aphids that feed on cultivated 'roses', worldwide. Metopolophium dirhodum has been recorded on 7 Triticum species (Triticum aestivum, Triticum compactum, Triticum dicoccum, Triticum durum, Triticum spelta, Triticum turanicum, Triticum turgidum). Several species of the Triticum genus are grown as 'wheat' the most common of which is Triticum aestivum. Metopolophium dirhodum has been recorded on 11 species of Hordeum. Metopolophium dirhodum has been recorded on 1 species of Zea. 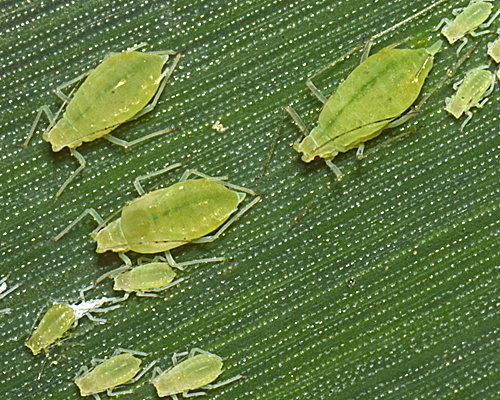 Aphids have been recorded on only 1 species of Oryza: Oryza sativa (Asian rice). 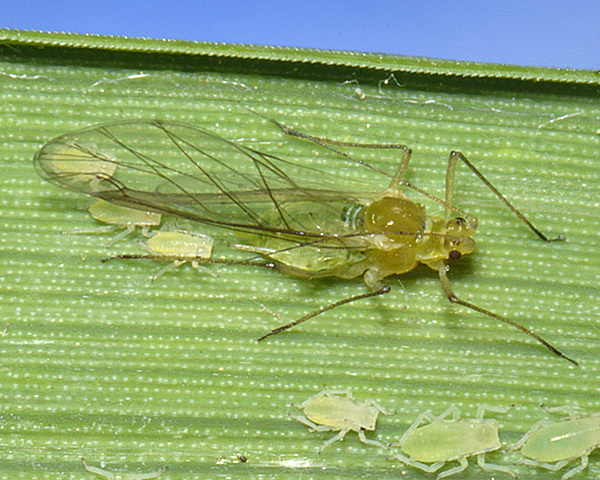 No aphid species are listed on Oryza glaberrima (African rice). We also thank Hadlow College and Middle Farm, East Sussex for their kind assistance, and permission to sample.